The SWF export now supports both bitmap effects (which can be previewed in Render View mode) and SWF Blend Modes (vector effects which can be previewed in OpenGL View mode). If you have not already done so, you should preview the SWF by using the SWF preview button to see what the two types of effects look like when blended together. Once you are satisfied with the results, go ahead and export your movie. 1. From the top menu, select File > Export > SWF. The Export to Flash Movie (SWF) dialog box opens. 2. To choose an appropriate file name and a destination path where your movie will be saved to, from the dialog box, click Browse. 3. In the Display Source section, select which Display module to read from in the Export From Display Module drop-down menu. ‣ Frames: To export a frame range. Enter the frame range in the fields provided. 5. In the Options section, enter your Frames rate (fps) into the field provided. By default, it will be set to match the fps of your Animate Pro project. If you choose a lower frame rate, your export playback will be faster than your actual project. The reverse is also true for a higher frame rate. 6. In the same section, select the JPEG quality. ‣ 1 = Lowest quality where there is extreme loss of colour and detail and where the image becomes nearly unrecognizable. 7. If you want to prevent your movie from being imported in another application, select the Protect from Import option. 8. Select the Compress Movie option if you want to get a lighter format. The movie may lose some quality, but the file will be lighter. 9. In the Disabled Effects section, select the options of the vector-based effects that you do NOT want to see in the SWF render. 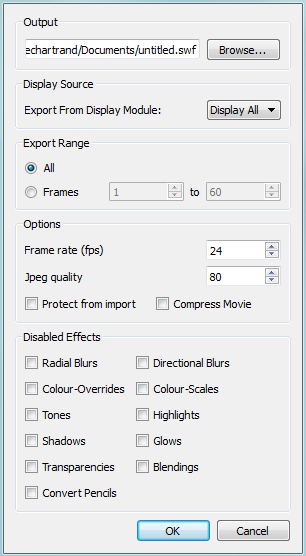 Note that certain Animate Pro effects will not be listed in this section as they are not vector-based and therefore not available for SWF export. These effects will not appear in the SWF render. 11. Browse to the location on your computer where you saved your Flash Movie and double-click on it to view your export.